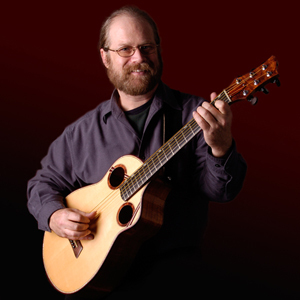 Todd Hallawell is a fingerstyle guitar wizard, and he’s been known to do a little flatpicking too. Since earning a performance degree in classical guitar, he has worked as music teacher, composer and arranger, recording engineer, music editor, producer, and co-owner of a record label, Soundset Recorings. He won the prestigious National Fingerstyle Guitar Championship in Winfield, Kansas, and has released three albums, including his latest, Ear Candy, recorded with West Virginia flatpicker Robin Kessinger. “What tone, what sound, what touch,” says Frets Magazine. Guitar Player Magazine calls Todd “an extraordinary fingerpicker.” Guy van Duser, Professor of Guitar at Berklee College of Music, says that Todd “is an acoustic guitar entertainer who can hold me absolutely still, or have me rolling on the floor with laughter, or even break my heart a little, on occasion. And he can make his guitar do some very cool stuff!” For an evening of very cool stuff on the guitar, catch Todd’s show at the Freight!